So here are the pictures of the cuties for sale at this time. ~The Roo is 10 weeks old and just starting to crow, his colors are coming in beautifully! If I didn’t already have a roo, I’d keep him! 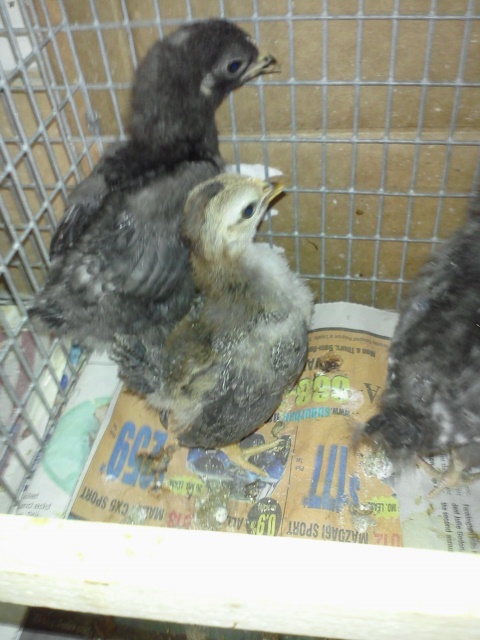 ~The all black and the cream colored ones are 6 weeks old. I have a hunch that 1 is a cockerel and 1 a pullet. ~The chipmunk stripped one is straight run and just over 2 weeks old. I don’t ship live birds so you’ll have to be willing to come and get them. So, our mission for fun continues with a trip to Michigan Adventures, an amusement park on the other side of the state. The kids had a blast! This trip has become almost traditional for our family. Now it’s back to reality, which for me, isn’t a bad thing. I missed my animals. I have found I am more of a home body nowadays. Now that I have my little farm, I never want to leave what I love! Within all the fun away, there was still fun going on here at home with the births of 12 new Coturnix Quail chicks and 1 Serama chick. 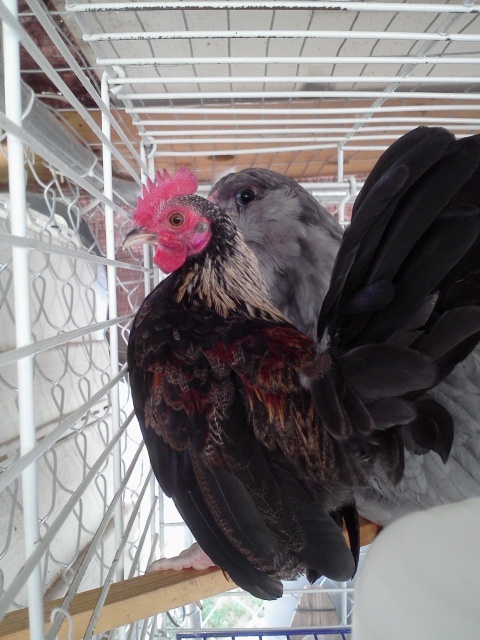 I also adopted 2 Ameraucana bantams! 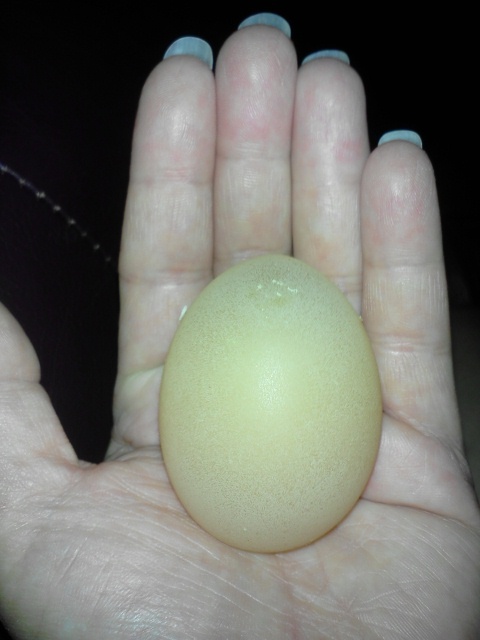 I also set more Serama eggs and will be setting more quail eggs in the incubator this week. I thought I was going to be done incubating until next spring, but then my husband talked me into one last hatch before we shut down the bator. Needless to say, the hatch-o-holic in me didn’t argue! Being a chicken keeper is always rewarding and often adventurous as well! Seems like everyday I am learning new things and experiencing new things about and with chickens. It’s a constant learning experience, even when you think you’ve heard or seen it all. Last night I noticed that “Grace” my 1 year old Delaware was acting kind of stand offish/listless. She is normally my shadow, she comes running to greet me the second she hears the doorwall open and my footsteps on the deck. She’s always the one under my feet waiting, full of curiosity to see what kind of treat I may have for her, but not last night. She was otherwise normal. No sneezing or wheezing, no signs of injury or sickness at all! What could be wrong with her I wondered. After a few minutes of close observations and examinations I concluded she must be egg bound. I’ve seen this before with one of my other hens when she first started laying. So I began treatment. I brought her into the house, carefully carrying her as not to break the egg stuck inside her and gave her a warm bath for 20 minutes. She really didn’t mind the bath at all, she even laid in it willingly. If you own chickens you know they don’t particularly like water for any reason other than drinking. After 20 minutes I carefully carried her back out to the run and put her in a dog crate to give her her privacy and let her rest. 20 minutes later I went back out to check on her and found this (see picture) a “rubber egg!” Sure enough, she was egg bound! “Rubber eggs” are called this because they actually feel kind of like rubber. They have a very soft shell. So why did this happen to my already established laying hen? Could be a couple things. More times than not when chickens eggs are soft shelled it’s for 1 of 2 reasons. 1 being that the chicken can be a new layer and her system is still adjusting to the job of egg production and laying. OR it could be because she has a calcium deficiency. To prevent this, you should always offer your girls free choice crushed oyster shell, which I always have out for them, but sometimes there will be 1 stubborn/picky girl who won’t eat it. This appears to be the issue with “Grace.” However, she is a large breed chicken and doesn’t seem to tolerate the heat well and it has been blazing hot here lately with temps in the high 90’s even up to 102 degrees. If you know chickens, you know that they can actually stop laying when the temps rise that high. I think “Grace’s” condition is contributed to the heat and the stress she was under being so over heated despite my efforts to keep her cool and comfortable. Since she can’t speak to me, I’ll never really know. If you have a hen who won’t eat the oyster shell, another alternative would be to offer crushed egg shells. I simply save my egg shells, peel out the internal membrane, let dry out for a few days then put in the microwave for a couple minutes to kill any bacteria. I then put the shells in a coffee grinder and offer it free choice to the girls. Another method you could use is liquid calcium added to their water which I had never heard of before until I asked another fellow chicken keeper (https://www.facebook.com/Egg.Carton.Labels.by.ADozenGirlz) if she thought there could be more than 1 egg stuck, because even though “Grace” laid her rubber egg, she was still acting like she had another still stuck, so she is still in isolation until she lays another egg or starts acting like herself again. I will keep you updated on her situation. Around 10pm Tuesday night we lost power for no apparent reason. We later learned that 11,000 people were without power due to a bad circuit and the power company had to cut power to an additional 10,000 people, us being 1 of those lucky 10,000, to fix it. It’s to my understanding that while trying to fix the bad circuit there was a major fire at the substation resulting in 16 hours without power! This was really bad at first because I have an incubator right in the middle of a hatch with 5 babies in the bator and 10 in the brooder and more eggs still due to hatch. 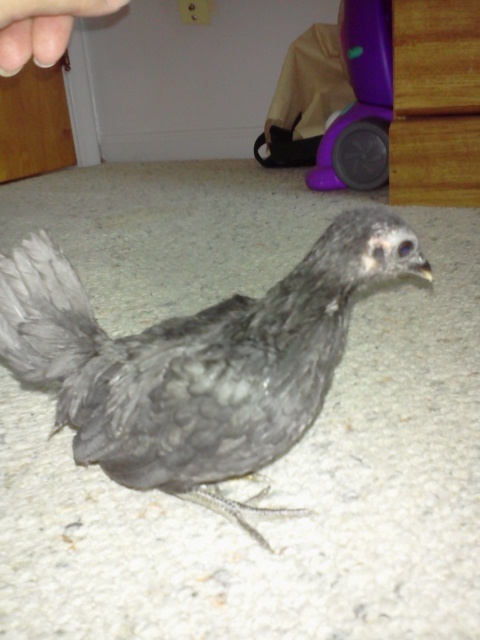 I sent my husband out to the store to buy an adaptor so I can run power from my car to the bator and brooder. It took about an hour to restore that much power. Prior to getting the adaptor, temps dropped to 80 degrees in the bator and 85 in the brooder. That’s bad news for new chicks and a hatching incubator. We are fortunate enough to have a gas stove so I heated some water and filled jars with the hot water, then wrapped the jars in aluminum foil to put in the incubator and brooder. This did help to raise temps in both. I will not know the extent of the damage unless I crack open the remaining eggs, but happy to report that the chicks seem to be doing great despite how cold they got and how fast. I even had 2 more chicks hatch early this morning! If you’re ever in this situation, quickly fill jars with hot water and wrap in foil then place where necessary. To help contain heat, put a towel over whatever you need to hold heat, in my case the incubator and brooder. I also recommend having on hand a power adapter for your car. For around $30 you get a great little gadget that plugs into the cigarette lighter in your car. You then plug an extension cord into that and plug in whatever you need plugged in. The one I have is a 100 watt, I was able to plug in my incubator, a heat lamp and even charge my cell phone. The bad news in using this method, is you have to leave your car running to get power, but it’s well worth it. I sure hope I never lose power again with eggs in a bator or chicks in a brooder, but if I do, I am now prepared! I’m sure most of you save your kitchen scrapes and feed them to the various farm animals you have, but have you ever considered storing them for later use? Since it is canning season and we don’t have pigs, fruit and veggie scrapes is something I end up with an abundance of. 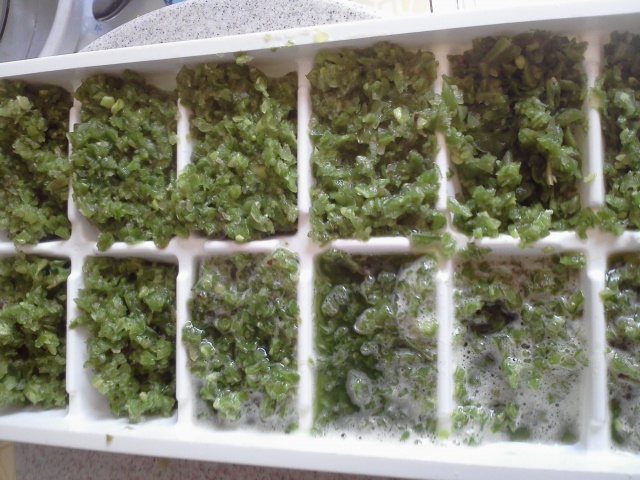 So I decided I would start putting the scrapes thru the food processor and then freezing the puree in ice cube trays for later use or as frozen treats on these really hot days of summer for the chickens, quail and ducks. I did the same thing with all the tomato waste from making sauce and the mushy blueberries that weren’t good to freeze and etc. etc. When working in the kitchen I try to not let anything go in the trash! With all this HOT weather, I was in the mood for some potato salad, but not your usual potato salad. I wanted to change it up a bit and try something new! 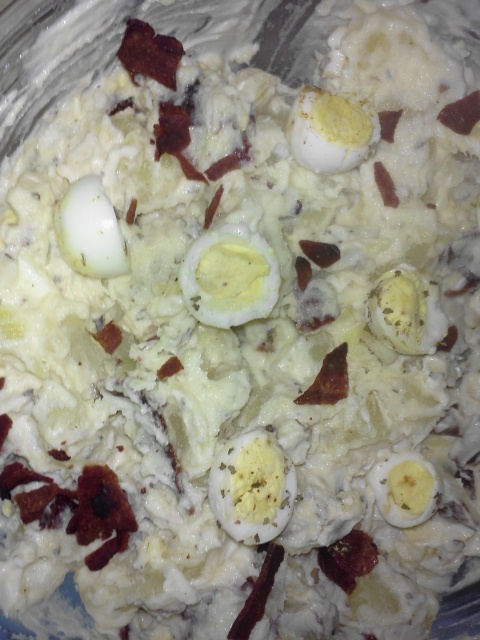 So I made Bacon and Quail Egg Potato Salad, and I think it was the best potato salad I have ever had! I started with boiling potatoes in chicken stock with garlic gloves. While they were boiling I cooked up some bacon, extra crispy and hard boiled some quail eggs. When everything was done cooking and cooled, I cubed the potatoes, crumbled the bacon and peeled and sliced the quail eggs. I also sliced up the garlic gloves that I boiled with the potatoes. In a large bowl I added the potatoes, bacon, half of the quail eggs, onion, tumeric, basil, and mayonnaise. Mix all together and top with the remaining half of the quail eggs, chill and serve. I did not measure anything out, I rarely do when I cook, so I can’t tell you how much of everything to use, I just go by my families personal taste. I think it was boiling the potatoes in chicken stock and garlic that is the key to such a flavorful potato salad. Gardening Tip From The Kitchen! Yesterday I spent the day being a food hoarder. My Mother had once again brought me home some wonderful Amish produce straight from their farm! There was so much of it I had to start processing it since there was no way we could eat it all before it went bad, and now that I am learning how to can, it was perfect! 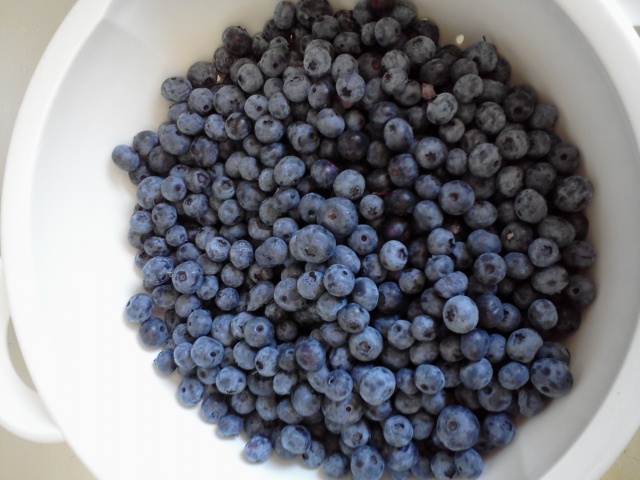 I started with preparing blueberries to freeze since I already had an abundance of blueberry jam. Oh and the thought of farm fresh blueberries in the middle of winter is mouth watering. Simply arrange the berries on a cookie sheet in a single layer and place in the freezer until frozen. Then package in ziplock freezer bags removing as much air as possible, label with date and you’re done!! Next I decided I wanted to do the same with the sweet corn since my family eats a lot of corn! 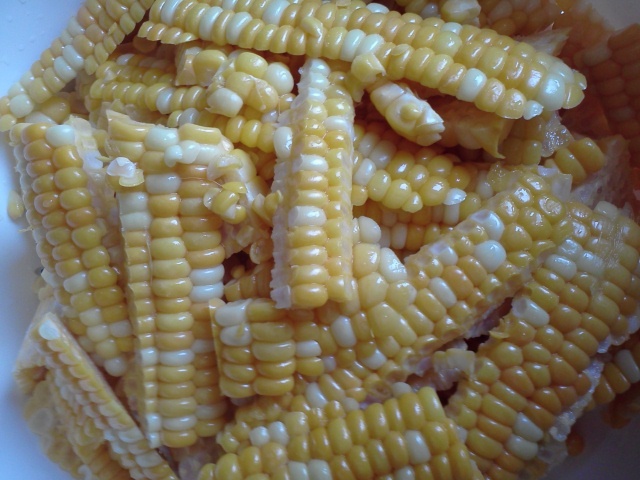 This is where the gardening tip comes in, To freeze corn, you first must blanche it on the cob for 7 minutes. Once the 7 minutes are up immediately give it an ice water bath to stop the cooking process. A general rule with this is, blanche 7 minutes, cool 7 minutes in the ice water bath. I then cut the corn off the cob. I had absolutely no waste of anything with this process! The corn goes into my freezer to feed my family. The cob goes into the freezer to give to the chickens this winter. *Note* DO NOT give chickens corn in the hot summer months because it warms them up too much, remember it’s hard for them to digest corn just like it is for us. It’s a great treat to give chickens in the winter months for this reason. Now for that gardening tip, the water that was used to blanche (boil) the corn in is filled with wonderful beneficial nutrients for your garden! Once it’s cooled, use it to water your plants and gardens, same with the ice water bath water! You can do this with any water that was used to boil or steam fruits or veggies in! Where we live, we have to pay for water and it gets EXPENSIVE! So whenever possible I try to reuse and recycle it. My next canning adventure was making peach preserves with all the yummy peaches I had! 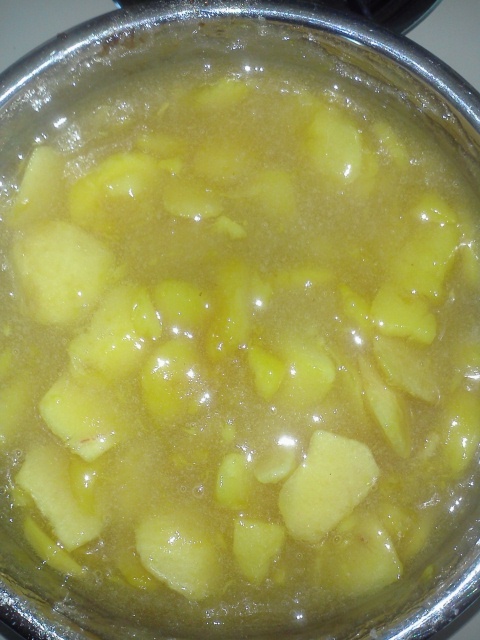 I had never done this before and wasn’t sure it was working at first, because I couldn’t understand how sliced peaches, 2 tablespoons of lemon juice and 6 tablespoons of pectin were going to be able to come to a boil, but low and behold, it did! The end result was delicious! Today, I will process some of Michigan’s finest cherries (our state is well known for our cherries.) I’m thinking I will freeze them as well, I mean, who wouldn’t love fresh from the tree cherries in the dead of winter! I will also process green beans and tomatoes! I see sauce in the very near future! Join us in helping to protect small breeders. Hello friends, We could really use your help today. The American Kennel Club is sharing a petition that will help to stop unnecessary regulations that will hurt small breeders, like us. Please take the time to go to this link and sign the petition and then share it on your facebook page or blog site or where ever you can. The time is short so please don’t put this off. Thank you in advance for your help!! Ever wonder whether or not that egg you’re thinking about eating is fresh or not? Here’s an easy way to find out. First place the egg in a bowl of water, make sure the bowl is deep enough to completely cover the egg. If the egg sinks to bottom of the bowl it is fresh. If it sinks to the bottom but stands up on end, it is still edible. If it floats, it’s bad, throw it away! Sorry I’ve Been Away….Injured Quail update! Hello my friends!! Sorry I’ve been a little busy lately, you may have noticed I haven’t posted in a few days. I have been house/pet sitting for my sister for the last 10 days. 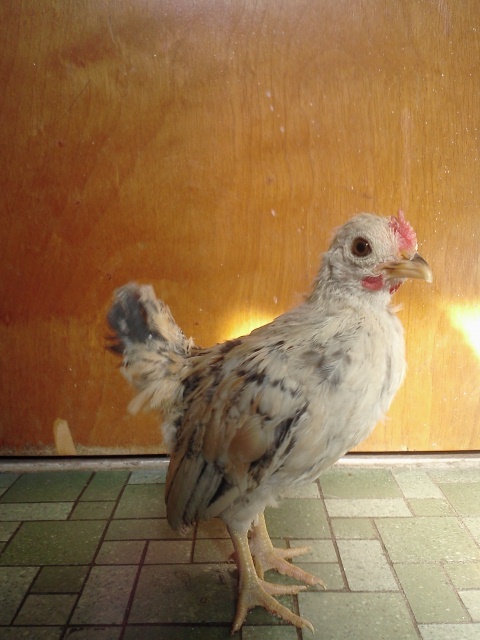 On day 2 her flock of Coturnix quail were attacked by a predator and all were lost but 1. You may remember hearing about this on my last posts. Good news is, he’s still alive! I’ve been nursing him back to health, but it hasn’t been easy. He still requires around the clock feedings and water thru a syringe because his eyes are still shut:( I’m not sure if he’ll ever see again. All the swelling has gone down but still they’re shut and I can’t figure out why other then they were badly scratched and my hope is they’re still healing. I have also been caring for her remaining 6 Bobwhite quails, 11 chickens, 9 cats, 3 dogs, 4 pet rats, 2 bearded dragons, 1 turtle, 2 snakes, a full incubator, a garden and bringing in the mail. That’s about 2+ hours of my day! I have also been watering my neighbors gardens, flower beds, and potted plants everyday, another 30-45 minutes of my day. My mother is also out of town so I have been making daily trips to her house to water outside plants and bring in mail. Not to mention I still have all my own house/farm/yard chores to keep up with. So there’s been little time to write. I will keep you all updated on the fate of the quail.